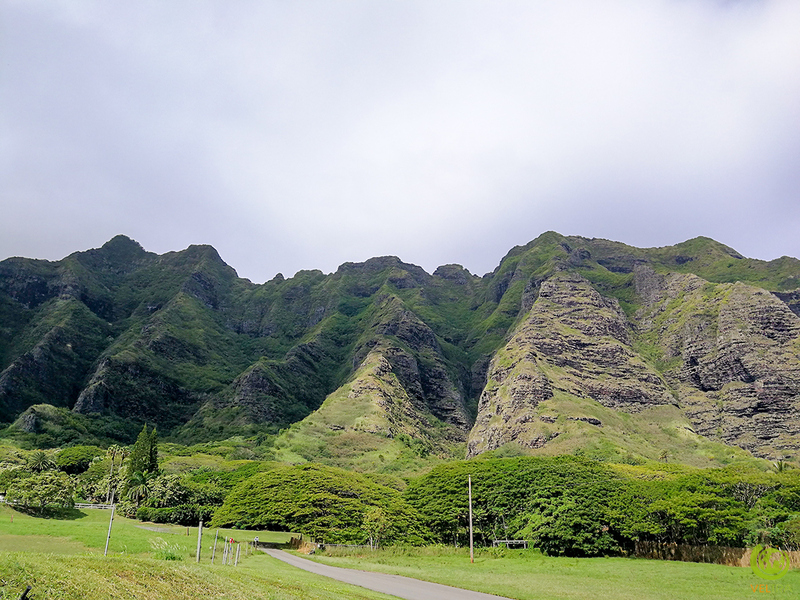 Kualoa Ranch is one of those places that people know about without actually knowing about. As I’ve written before, the ranch has been used as a backdrop for many Hollywood films, and for good reason: the place is gorgeous. 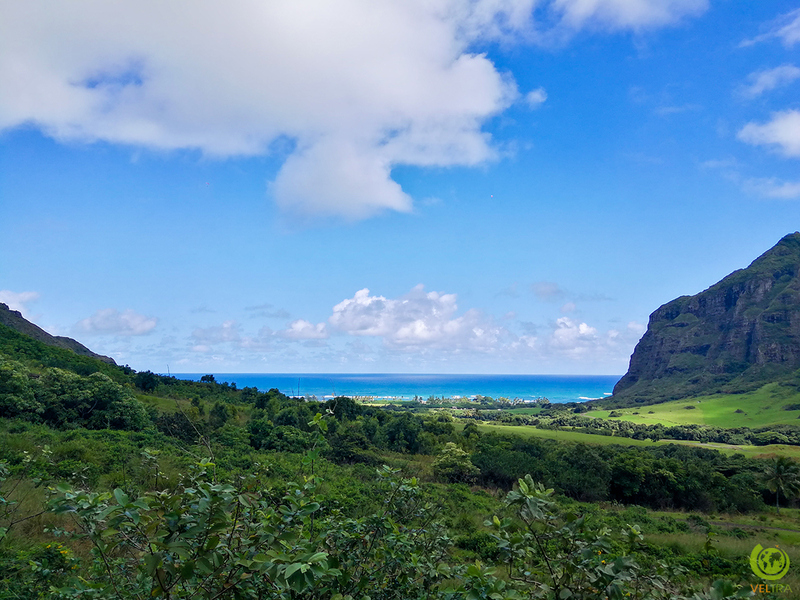 Multiple tours operate in Kualoa Ranch, whose 4,000-acre property spans over three different valleys. 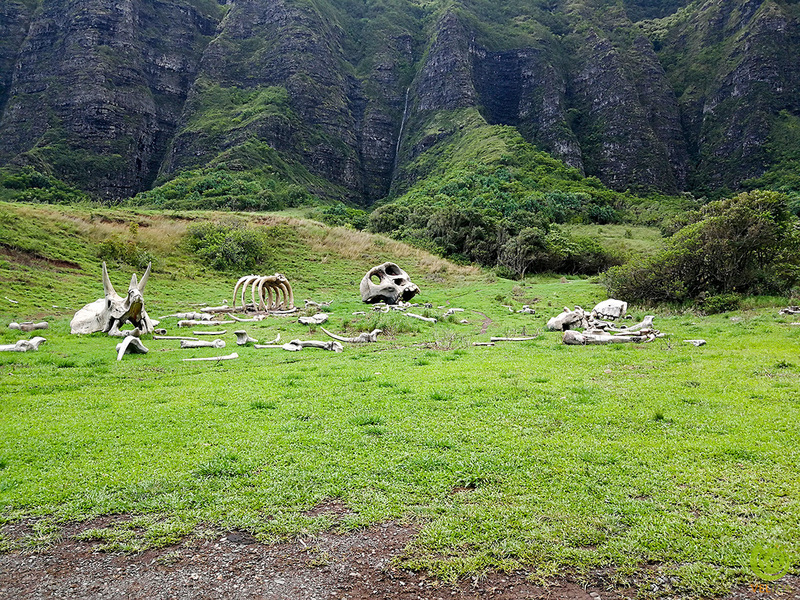 Most of these tours visit the various movie locations, allowing visitors to see and pose next to different film sets and props, including fake dinosaur bones from Kong: Skull Island, a giant footprint from Godzilla, and a bunker from the (upcoming) Jurassic World 2. While the most common tours around the property go by bus, ATV, or horseback, I chose instead to do something different this weekend and ride around the ranch on a mountain bike. 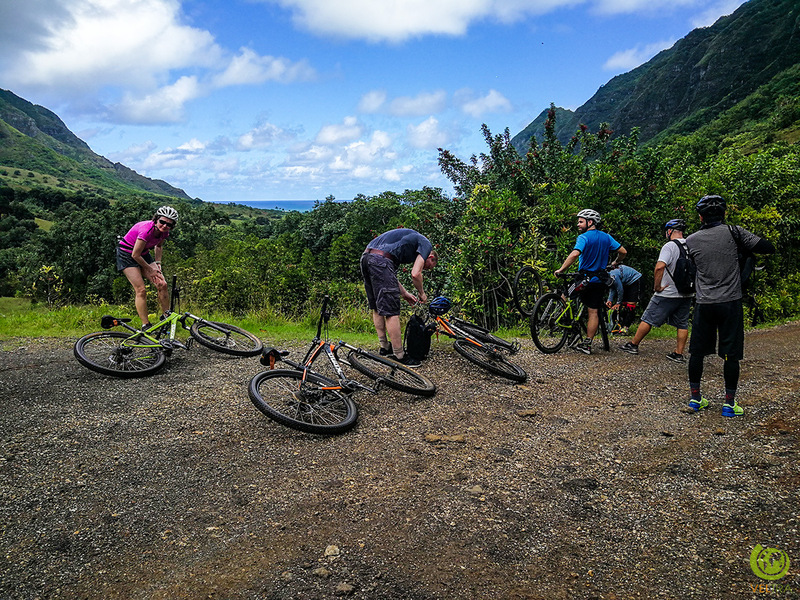 Bike tours of Kualoa aren’t actually operated by the Ranch itself, but rather a third-party company, Bike Hawaii. 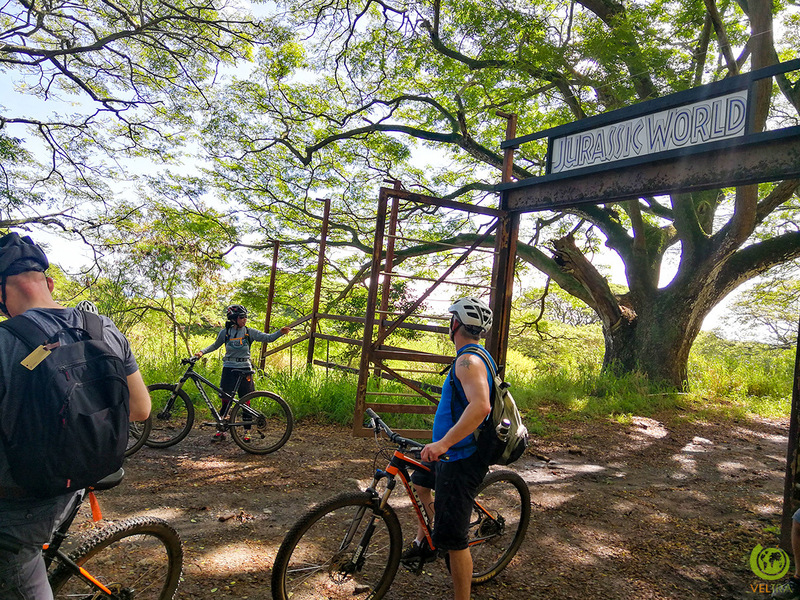 A small, locally owned and operated company, Bike Hawaii offers a variety of nature tours, from mountain biking, snorkel sailing. Tour groups are usually small as well, and the guides are knowledgeable and friendly residents of Hawaii, who bring their own background and personality to each tour. With that said, this tour checks off two items on my “great tour” checklist: local company, small group. 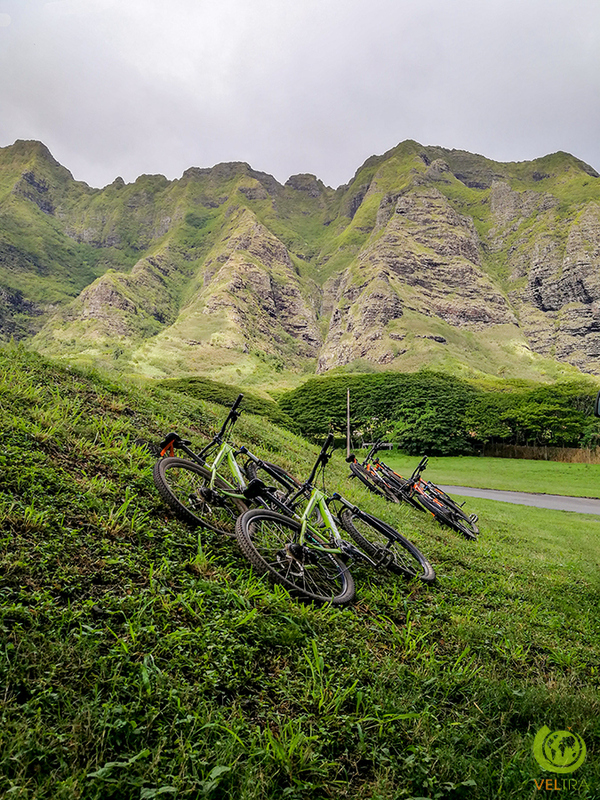 Doing the mountain biking tour of Kualoa Ranch seemed like it was right up my alley. The only problem was that I’d never gone mountain biking before. I have been riding bikes, however, but that was mostly on the road for my work commute. Getting on an actual mountain bike with 10+ gears and front shocks was something of a new experience for me. The tour began with our guide, Keala, handing out water and snacks (with handy hip pouches to hold them), and giving us a short orientation to the bikes and trail. We also got to test out the bikes for a few minutes, which was crucial in getting comfortable with them. I definitely needed the time to get used to switching gears so often, as well as figuring out which lever shifted up and which shifted down. For the record, I didn’t really get comfortable with it up until about twenty minutes into the actual trail ride. One of the benefits of having a small group tour, apart from being a more personal experience and getting more attention to each individual, is that the pace of the ride was adapted to our group. We did have some experienced riders, which meant I was generally at the rear of the pack, but the pace wasn’t so fast that I felt like I was lagging behind. In any case, there were enough stops often enough that I could have easily caught up. At each stop, Keala talked about the area, it’s history, and the cultural context of whatever landmark was in our vicinity. Keala was an excellent guide. 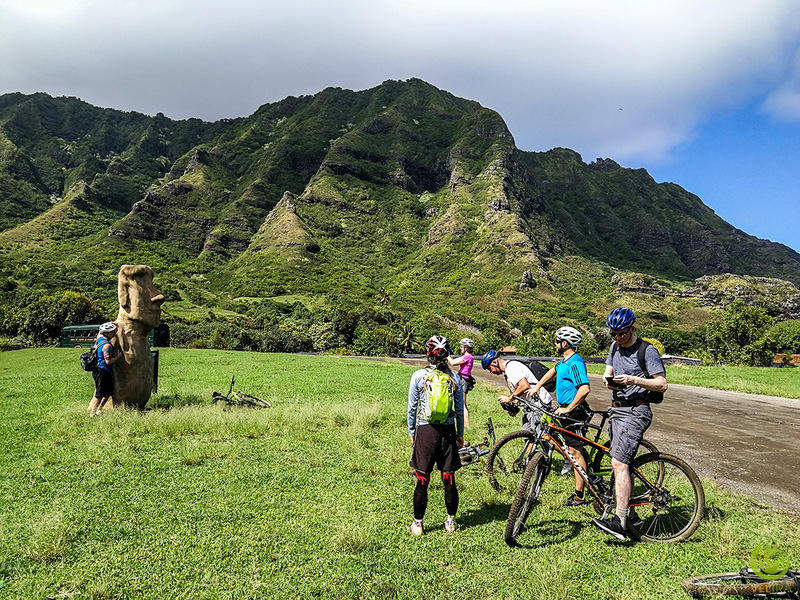 Not only did she know a lot about mountain bikes, she also made the entire tour much more interesting by offering information about Kualoa’s history, Hawaii’s culture, and the significance of the flora and fauna in the area. Besides that, she was also an awesome person, being engaging, encouraging, and enthusiastic with everyone for the entire duration of the tour. She told us she generally adapts the biking route according to the skill and comfort level of each group, which is understandable when you’re using manpower to navigate routes that are normally reserved for ATVs. Keala even popped her rear tire at one point in the tour: she just pulled out a spare tube and swapped it out in minutes—all the while telling us more about the area, about mountain biking, or just chatting with us—and then we just kept on going. In general, most of the trails we rode on were meant for larger vehicles, with some being specifically made for horses and cattle. 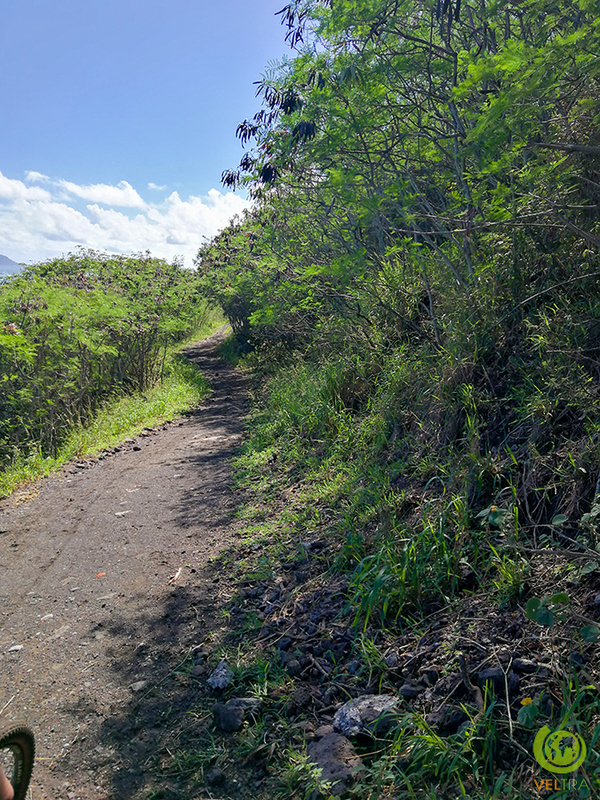 Only a few routes were the single-track dirt paths that mountain bikers are used to, and those were generally made to connect between larger roads. The weather needs to be mentioned, as your experience can vary quite a bit depending on what the conditions are like on the day of your ride. We were incredibly lucky on the day of our biking tour with mostly clear skies, with only a few clouds clinging to the nearby mountains to cover up the sun for us. 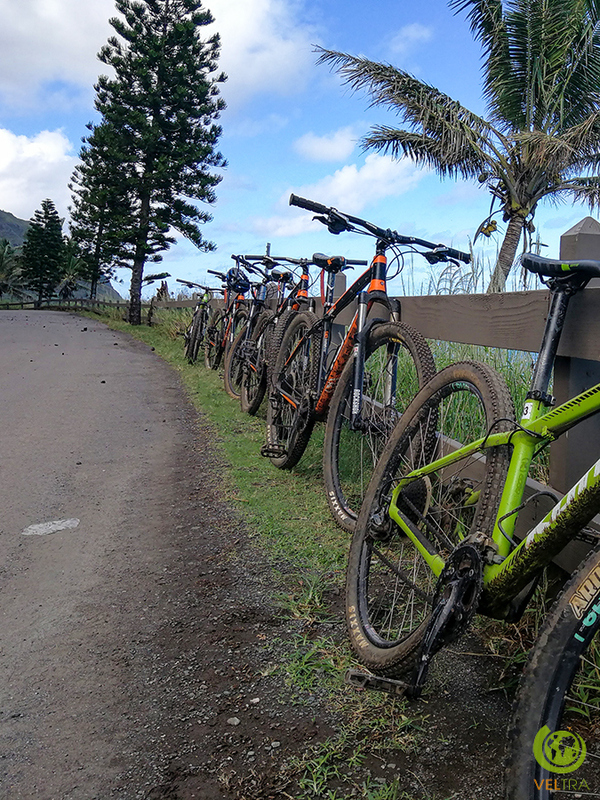 The previous day, however, had rains heavy enough for the state to issue flash flood warnings, so the trails had plenty of mud puddles and the dirt was soft—with the consistency of peanut butter, as Keala described it. On a lot of the flat parts, this wasn’t much of a problem, as we either had room to navigate around any sketchy terrain or momentum to power through it. On the typical cardio hill, however, I slipped off my bike multiple times and was forced to walk most of the way to the top. Oh yeah, there was a “cardio hill” on the trail. It was hell. But it led to heaven. 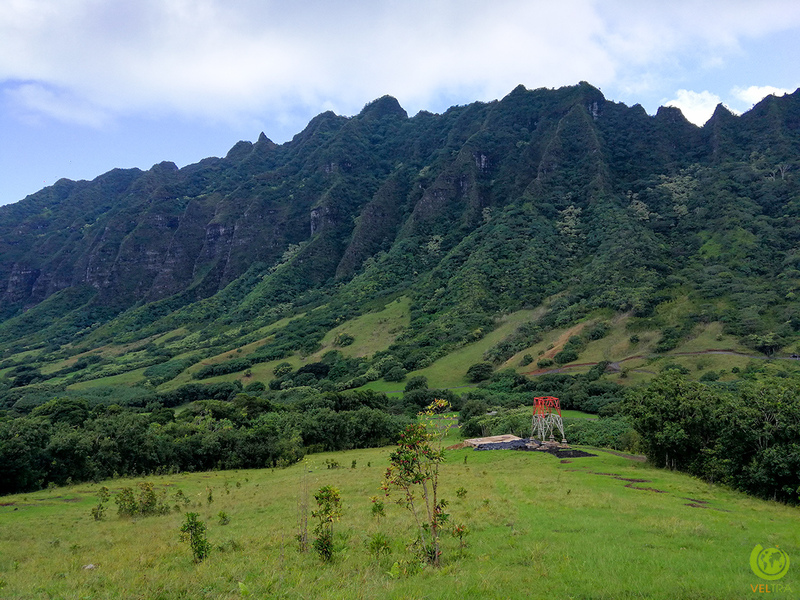 I’ve said it before and I’ll say it again: Kualoa Ranch is gorgeous. Even though the hill was really steep, kind of washed out from the rain, and not at all an easy climb for a novice mountain biker, it was the right kind of challenge that made the tour exciting and memorable for me. While we passed multiple other visitors around the ranch doing horseback, ATV, and bus tours of the valley, I couldn’t help but feel like I was somehow more connected to the place I was exploring by virtue of using my own two feet to get around. Navigating the terrain, feeling the breeze, adapting my pedaling and gear shifts to the hills, it really felt like I was experiencing the valley in a holistic way that I wouldn’t be able to feel on a tour bus. I also felt like I had more control or choice in where I went and how quickly (even though I was still following a guide like every other guest), which I never feel when I’m getting ferried around on a tour bus or van. 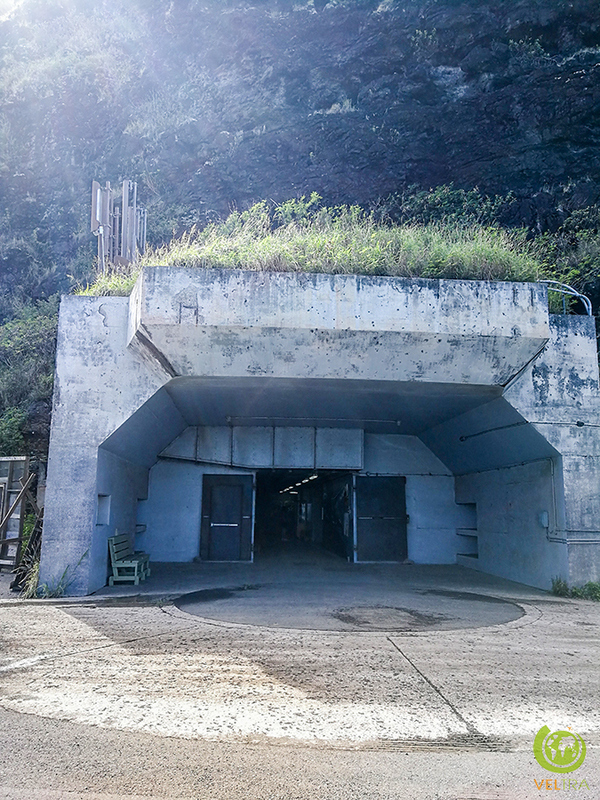 Our biking adventure concluded with a visit to the old bunkers and a long, easy downhill portion where I didn’t bother to pedal—I was too tired from the entire tour, anyway. We were treated to sandwiches, chips, and cold water when we got back: a well-earned lunch after a vigorous workout. Tired and more than a little muddy, a shower and a nap were in order as soon as I drove home. Two days later and my legs are still a bit stiff, but I know the experience is going to stick with me long after the soreness fades. 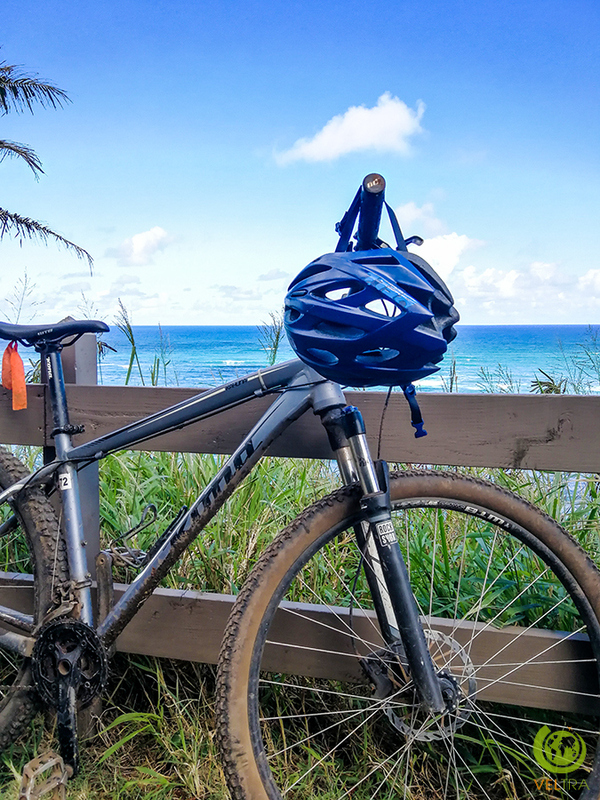 Bike Hawaii’s Mountain Biking Adventure in Kualoa is offered on HawaiiActivities.com! We also featured this in our list of Adventures for Thrill-Seekers, so check it out if you haven’t already!